Home / Parking Matters Blog / Down a Different Road? A few years ago, I saw Robert Kennedy, Jr., speak at the IPI Conference about “green” issues; I’m not especially green and so it was a bit of a stretch for me. But one of Kennedy’s themes stuck with me—the idea of the emerging green industries and how the U.S. could recapture global industrial leadership by becoming influential in this area. As IPI contemplates the advent of autonomous vehicles, the most often heard pundit opinion is that self-driving technology will make parking obsolete. Cars will simply drive themselves out to the middle of the Mojave and wait ’til we call them to come and pick us up. There is something in that vision that doesn’t ring true to me. Two weeks ago, I attended the European Parking Association conference in Rotterdam, and the Euros are all hanging their hats on electric cars. Several of the major European auto manufacturers—that own American labels—and now the Chinese have stated that they will not build petroleum-fueled vehicles after 2030. As I drove around western Europe, I noted the large numbers of public and private EV charging facilities in downtown and suburban areas and the large numbers of people using them. The EPA is putting considerable energy into developing new theory and design to accommodate electric vehicles. 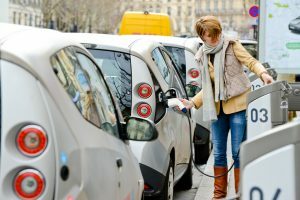 Perhaps we are guessing a bit short and autonomous vehicles and endlessly reducing traffic will not be the end result of the current change cycle; perhaps we will convert to cheap, pollution-free, and locally provided electric energy to fuel our cars, and traffic volumes will expand and not decrease. Then what? Most of the municipal planners I know are busy planning for the demise of the motor vehicle. Someone better let them know. David Hill, CAPP, MA, is chief executive officer of Clayton Hill Associates.